The shared workspace is buzzing with conversation. Entrepreneurs, students and partners who fill the room, which is dubbed the fish bowl for its exterior glass wall, move quickly between desks as they strategize on their latest ventures. As the commotion crescendos, Alex Zvibleman can’t help but sit back and observe – not out of distraction, as most reasonably would, but out of admiration. He watches participants in the first Ameren Accelerator cohort from afar and imagines himself, an aspiring entrepreneur, in a similar position. The Ameren Accelerator, an innovative program that assesses, mentors and invests in energy technology companies, began its inaugural cohort in July after selecting seven finalists. 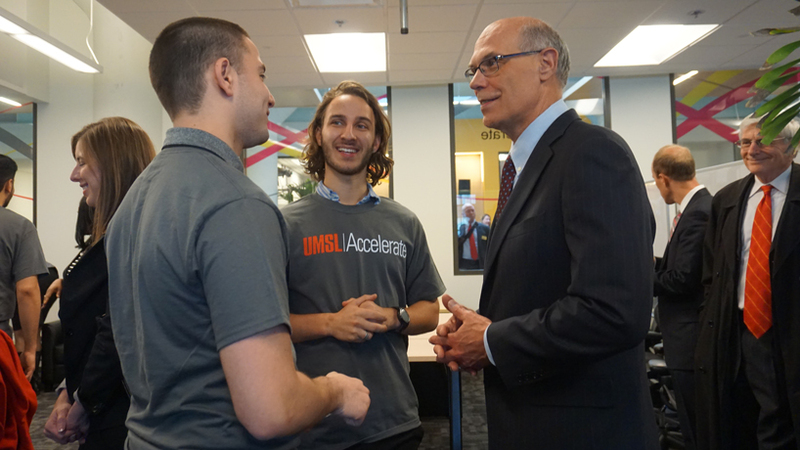 Since then, 10 UMSL students have worked alongside the startups as interns during the 12-week program. 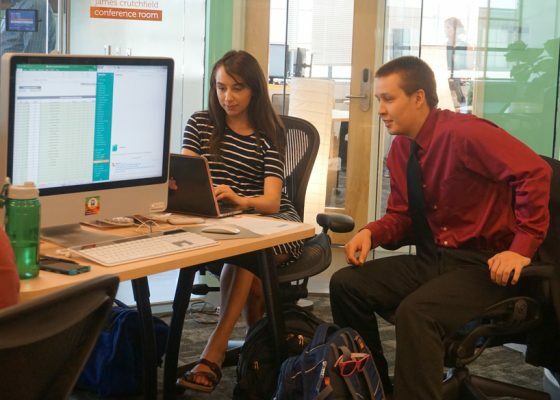 The skill sets and career interests of the interns vary from budding financiers to website developers, but they share an enriching and immersive experience. At the center of these solutions are the interns who are contracted to work 20 hours a week – although many eagerly clock in more. The matching process for the startups and interns was a learning experience in itself. The 10 students, who were already narrowed down from a pool of 30 applicants, stood in front of the CEOs of the startup companies and had just a few minutes to pitch themselves – an intimidating but worthwhile experience as many recall. Then the roles were reversed and the panel of executives explained their products and the skills they desired in an intern. From there, the matchups fell naturally. Warsing, a Rebate Bus intern whose already been offered a part-time position with the company until she finishes school, said she’s learning to embrace the networking opportunities offered within the internship. She’s not only working directly with an individual startup but standing among partners in the program, which include the vast networks of Ameren, UMSL Accelerate, the University of Missouri System and Capital Innovators. Zvibleman also made note of the advantages of merging the resources of these thought-leading organizations. For one of his projects, Zvibleman developed a survey for WIFIPLUG that was distributed to 5,000 Ameren customers. He was called upon to craft the questions, administer the survey and then analyze responses. “Beyond the connections, beyond the people I’ve met and the opportunities that I’ve had, I’m a firm believer that if you learn something, it’s with you forever,” he said. Warsing said her individual projects have also challenged her to pick up new coding skills that she hasn’t yet learned in her UMSL curriculum. 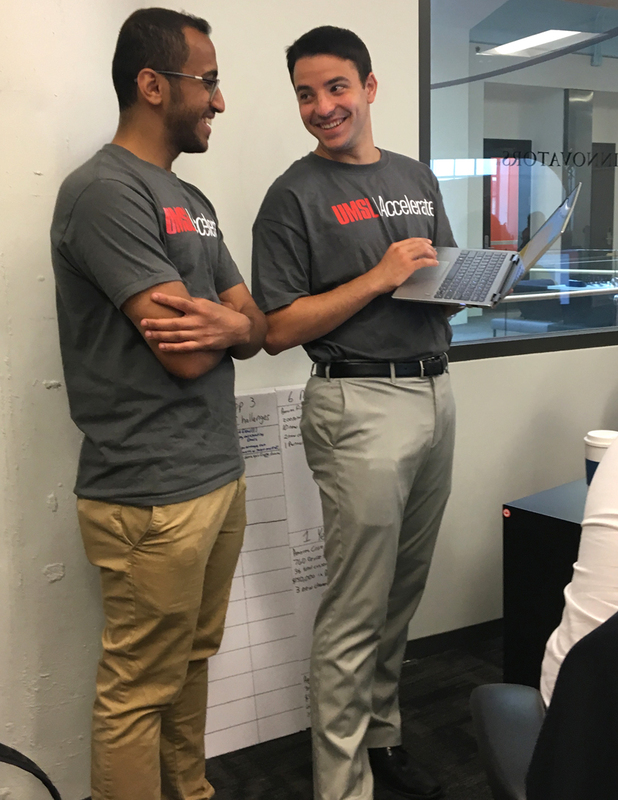 Mohammad Aljamaan (at left) and Yaniv Dudaie are two of the interns working with companies in the Ameren Accelerator cohort. In addition to technical skills, OmegaGrid intern Yaniv Dudaie has developed a fresh mentality for approaching new tasks and situations. He embraces each encounter offered through the internship as an opportunity to learn something new from driven and motivated individuals. A promising entrepreneur himself, Dudaie considers his career lane to be the “business of doing good.” As evidenced by his selection of undergraduate studies in finance, supply chain and international business, he doesn’t want to limit his experiences to a single industry. He saw the Ameren Accelerator internship as an ideal outlet to continue this pursuit and gain experience in the energy sector. Similarly, the startup executives are raving about the students. The accelerator program will conclude later this month with Demo Day on Oct. 26 at the Blanche M. Touhill Performing Arts Center, but the lessons provided through the experience will have long-term benefits.